I kept hoping September would be hot and I’d get to do a little more swimming in the lake, especially since I got some wild swim shoes or water shoes or whatever they’re called! I waited and waited for them and now it’s cool. There’s no denying fall is in the air, and right on time this year and I’m already thinking about pears and apples. In the meantime, though, I’m pulling out one last summer hurrah. I’m breaking out with this Strawberry Dream Cake. See, my son’s girlfriend couldn’t stop raving about a strawberry cake she’d had at a shower and then she found a picture that she thought looked like it. And so we ran right out and got strawberries. It was a couple of days though before I actually got to the Strawberry Dream Cake, but oh was it good and worth the wait. 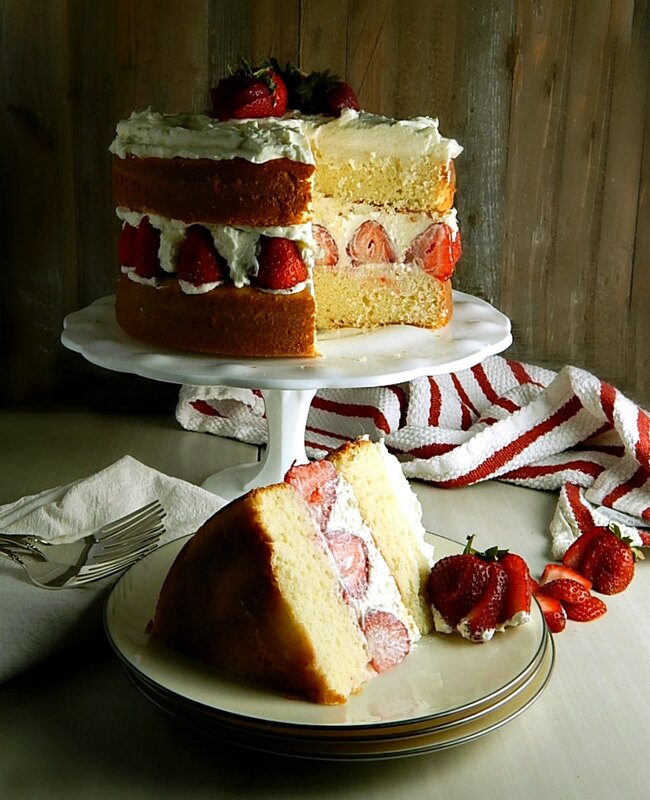 The cake we based my Strawberry Dream Cake on is this a Southern Living Strawberry Dream Cake. As you can see, mine looks (and is) a bit different, and I’ll explain why as we go. But first, let me tell you a little more about the cake. I’m gonna give you a lot of detail (fair warning) but the cake’s really pretty easy, there’s just a bit to know to pull this off successfully. What we have here are two layers of a somewhat sturdy cake. It has to be a little sturdy or the top layer won’t properly perch on the layer of strawberries. The cake’s almost like a pound cake; just a little lighter and is quite moist and lightly scented with vanilla and almond extracts. I can’t tell you how good that touch of almond is in this cake and in the frosting and how well it goes with the strawberries! And to think I almost left the little touch of almond out, except for I paid attention to one of the reviewers of the original cake. The frosting itself is so good, I wouldn’t hesitate to serve some of it as a kind of a dip at a shower or function with strawberries as the dipper along with a few other items – and I might even have to work on that recipe in the future! I had no idea what a heavenly combo strawberry and almond are! And I might or might not be eating one of the last pieces right now, lol! So I know what I’m talkin’ about! So sandwiched between the cake layers is a whole row of strawberries! Those strawberries are embedded in a layer of frosting and then there’s more frosting and more strawberries on the top of the cake, just for good measure. I wanted to skip the fussiness of some of the piping around the strawberries (like on the original cake) and left the sides unfrosted, kind of like an old-fashioned strawberry shortcake. It really was the right call. The whole cake is just gorgeous, and even more so “in person” or should that be “in cake? !” Really, the photos don’t do it justice. I’d make it again just to get better photos, in better lighting and do a better job with the frosting, but maybe my “candid” shots are more true! The cake itself as easy enough to make. You have to fold the lighter egg whites into the heavier base, but other than that, it was a piece of cake. (snort!) The one thing I would do differently would be to not flour the cake pan because that always gives the cake a bit of a crust as you can see. I did use parchment on the bottom of the pan and that would be enough. I also made a little “test” cake and there is one thing that improves the cake. Wrapping the layers and resting them overnight allowed the moisture to distribute through the cake, and it was even better the next day. Kind of in the same way a quick bread improves overnight. I’d recommend baking the cake the evening before and frosting the next day. I did make the cake in an 8″ cake pans rather than 9″ cake pans because when I got ready to make the cake I realized that my 9″ cake pans had been stolen from my house in a burglary. I’m still “discovering” things missing! But after I read reviews saying there wasn’t enough frosting, I thought it would be fine to go with a smaller diameter cake. I think the proportion of cake to frosting is just right with the 8″ but if the layers look too thick for you, feel free to make three 8″ layers and use one layer for something else. Freeze it, maybe. I don’t think to make this cake three layers tall would work out well; you’d need two layers of the strawberries and frosting and there won’t be enough stability. Where I did take a lot of liberties, based on reviews I found of the Strawberry Dream Cake, was with the frosting. First of all, there were complaints that there wasn’t enough of the frosting. that the frosting didn’t hold up, wasn’t stiff enough to support the cake and strawberry layer, and didn’t cut well. I solved the first issue with my 8″ cake pans and by only frosting the top and filling the cake. I used 8 ounces of cream cheese rather than mascarpone because I wanted a sturdier filling; bonus – the cream cheese is going to be more cost effective unless you make your own Mascarpone. I did, but then decided to go with the sturdier cream cheese, so now I need to use my Homemade Mascarpone for something else! I adapted the frosting to make a thicker “filling” for the strawberry layer and then used the same mixture, lightened with more of the whipped cream as a “frosting” for the top. As I was piping in the filling, I realized that the strawberries were a bit like a wiggly tooth. I piped a dab of the filling on the bottom of each strawberry but realized what I should have done was to just put a thin layer of the filling atop the cake before adding the strawberries. Apparently, this was in the original recipe and I missed it! I refrigerated the whole filled and frosted cake. Four hours at a minimum and several hours are even better. The cake was still very good two days after filling and frosting but after that became a bit dry, mostly on the bottom layer’s edges, where there’s no frosting. Those steps made the layer of strawberry and filling a little sturdier (and very rich and delish) and the frosting on top very creamy and dreamy. The cake held up like a dream and tasted incredible; that’s probably why it’s called Strawberry Dream Cake. And the proportion of the white creamy filling and frosting with the cake seemed perfect to me. Do make sure to use strawberries that are as uniform in size as possible. I bought two packs so I could pick and choose, then trimmed them all to the same size. I’d suggest washing the strawberries ahead by quite a while before making the cake so they will be perfectly dry. Make sure to have a use for any leftover strawberries and don’t forget the portion you trim off still has a lot of flavor. Think about adding them to a pitcher of water and making my Spa Water on a Budget for a fun treat. Make the Cake Layers: Preheat oven to 350°F. Spray 2 (8-inch) round, 2-inch-deep cake pans, line the bottom with parchment and spray again. Beat the butter with a heavy-duty stand mixer at medium speed until fluffy; gradually add the sugar, beating well. Add the egg yolks, 1 at a time, beating just until blended after each addition. Whisk together the flour, baking powder, and salt; add to butter mixture alternately with milk, beginning and ending with flour mixture. Beat at low speed just until blended after each addition. Stir in the vanilla and almond extracts. Beat the egg whites at high speed with an electric mixer until stiff peaks form. Stir about one-third of the egg whites into batter to lighten it; fold in remaining egg whites in 2 batches. Spoon batter into prepared cake pans. Bake in preheated oven until a wooden pick inserted in center comes out clean and the center springs back when very lightly touched, 28 to 32 minutes. Do not overbake. Cool in pans on a wire rack 10 minutes; remove from pans, and cool completely on wire rack, about 1 hour. Cake improves if wrapped and refrigerated overnight. Meanwhile, before making the Filling/Frosting, cut a thin slice from stem end of each of 20 to 25 whole strawberries to form a flat base; Cut carefully, trying to keep all strawberries at the same height and cutting at a right angle so strawberries will sit flat. Set strawberries aside. Cut several strawberries into slices or slice and fan several strawberries for the top of the cake. Set aside. Cut the top of each cake so the cakes are level. Brush off any crumbs. Set the first layer on a cake stand, cut side up. Beat cream cheese with 1/3 cup of sugar until lightened. Set aside. In another bowl, beat whipping cream, vanilla and almond extracts with an electric mixer at medium speed until foamy; increase speed to medium-high, and slowly add remaining 1/3 cup sugar, beating until stiff peaks form. With an electric mixer, beat one-third of the whipped cream mixture into cream cheese mixture. Gently fold in about one-third more of the whipping cream into the cream cheese mixture. This will be the filling for the center of the cake. Set aside the remaining whipped cream. Spread a very thin layer of the cream cheese/whipping cream mixture on top of the first layer of the cake. Add the strawberries to the cake, flat side down, lining up first around the outside and working toward the center. Trim the sides of the strawberries if needed to cover the top of the cake, making sure not to trim the edges that will show. Fill a piping bag with about a cup and 1/4 of the cream cheese/whipping cream mixture. Pipe mixture between the strawberries, filling all the spaces. (If more of the cream cheese/whipping cream mixture is needed, add more.). Carefully spread a little more (about 3/4 cup) of the cream cheese/whipping cream filling across the tops of the strawberries, making sure it is level. Add the next layer of cake, cut side up. Place any remaining cream cheese/whipping cream mixture back in the bowl. Beat to lighten. Fold in the remaining one-third of the whipping cream. Spread a thin layer on top of the top layer of cake. Add the remaining mixture on top of that. Refrigerate for four hours (minimum) or longer. Before serving, add sliced and/or fanned strawberries to the top center of the cake. I’m still holding out that we might have a few days hot enough so I can wear my water shoes in the lake and swim once last time! This entry was posted in Click here for Fabulous Food Posts and tagged Cake, Cream, Cream Cheese, Desserts, Frosting, Fruit Desserts, Strawberries. Bookmark the permalink. I absolutely love this strawberry cake. I am bookmarking this recipe to try. Thanks for sharing at Fiesta Friday! I think you’ll love it! I wish I had some right now! Oh my Mollie …this cake looks amazing. I was getting nervous as I read how you were slicing the strawberries to get to the same height:) How amazingly beautiful. Thanks for sharing on Fiesta Friday! None of those strawberry pieces went to waste and I think that was key in getting the cake straight – conveniently left out of the original recipe! Thanks Zeba! Finally, a cake from you! !😁 I’d definitely take a slice! The photos are amazing, Mollie! Happy Fiesta Friday! Yeah, it’s been awhile since I made a cake! And lately most of my cakes have been of the more humble variety, not big “fancy” ones like this!! Thanks Jhuls, and happy FF to you, too! Mollie! 😀 That is most definitely a ‘dream’ cake and your photos are perfect! I love all the tips you’ve given – it makes the making so much easier! Oh and I can’t possibly believe someone stole your pans – I had to read that twice as I thought I’d read it wrong! Random indeed! Thanks for bringing this over to Fiesta Friday! Have a great weekend. Well, they got all the appliances, tv’s, etc., every tool except a 2″ screwdriver they missed, then anything worth any money, and then just a bunch of random things and some of my copper piping. Now every time I can’t find something, I think it was stolen! I’m quite sure they took all the matching socks, lol! Well, it’s over and done with, but it is a constant jarring feeling every time I realize something is missing. They took my copy of Jacques Pepin and Vanessa from Food In Books sent me one! Such a sweet gesture! A lovely cake and very much in the Scandinavian style. I like the idea of using the cream cheese, as we use 37% heavy whipped cream. It looks good for about and hour or so then gravity sets in. Now, I just have to find fresh strawberries. If not, next years midsummer celebration cake. We just lucked out with the best berries from Costco and they were cheap! I didn’t check to see where they were from…I didn’t want to know, lol!! This is one of those cakes everyone should make at least once! Thanks Tweety, I loved that cake and can’t wait to make it again! What a beautiful cake! I am so hungy just looking at it. It’s definitely a show stopper and I can’t wait to have an excuse to make one myself! Carlee, anytime you see good strawberries is the perfect excuse! I know you’d love this cake! I know, and that bit of cream cheese really made the cake. The frosting was so good and not too sweet. 🙂 Quite a few people seem to be allergic to strawberries. My sister used to tease her husband when he did something she didn’t like and he asked what’s for dinner. She’d say strawberries! Just beautiful. You’re very talented. I don’t do cakes. I love the sound of swimming in a lake, but I cannot handle summer weather, so always look forward to fall and everything that it brings! Thanks, Mimi, that’s the sweetest thing to say! I do just “come alive” when the fall weather arrives. I think it’s my fave time of year. Oh, yes, and thanks. I’m still dreaming of it now that it’s gone. I think it would be wrong, though to make this cake once a week, lol!! I wish my cake decorating skills were better! But still tastes as good, right! And thanks! I’ve had this cake pinned for a while to try. Thanks for showing how it’s done Mollie, it looks great! Jess, I would LOVE to see how you would make and present this!! 🙂 Whatcha been up to – I haven’t seen you for awhile. Hey Mollie, I missed posting last week, but there will be another one up this Friday! That’s just mental that someone stole your cake pans. I can’t even fathom the thought process that went into that!! They took all the usual stuff you’d expect, tv’s etc, and then a bunch of weird stuff that’s really random! lol!! See we’re twinsies, lol!! Your desserts are always so beautiful! Even sounds delicious! What a name, right? And thanks Robin. I would actually love to do a “redo” of this cake and hopefully get better pics, so thaks! There’s only so much cake a couple of girls can eat, though! I understand. If i made this beautiful cake, I would obliged to eat 7/8 of it, because Hubby will only eat one serving of most desserts I make. Gosh, some people just do NOT have a sweet tooth! Lucky them!! Or maybe lucky you, lol!! This looks amazing!! And your photos are so fabulous!! Thanks! And maybe I’m just too hard on myself about the pics. They’re not my fave at all. But the cake was so good. And that’s high praise from me considering that it’s not chocolate!